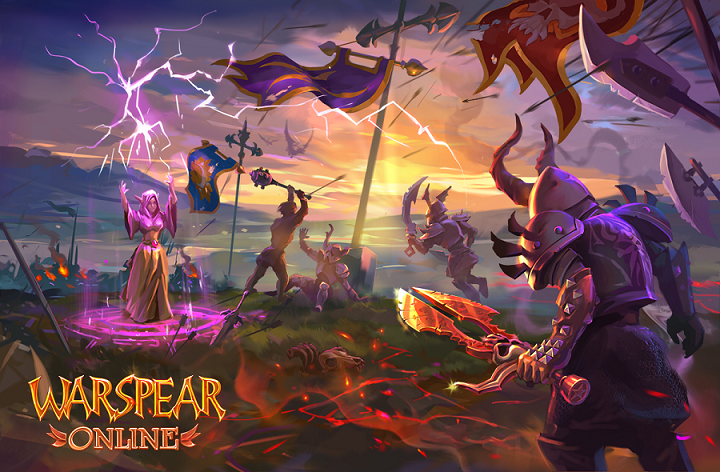 The Warspear Online 4.7 update will be available right after the restart of our game servers for Android, Symbian, iOS, Windows Mobile, Windows Phone 8, Windows, Mac OS and Linux! Please, note that the actual release of the different versions may vary. Faster and cheaper Guild updates! We’ve lowered the price of updating Guilds starting from the 4th level! Now you need up to 30% fewer Guild Points to level up your Guild and learn passive and active Guild Skills. The required number of Unity Signs was also reduced. So now is the best time to start working on developing your community! And more good news! For those who have already leveled up their guild to the fourth level or more. Due to the new prices we will make a full refund of Guild Points! 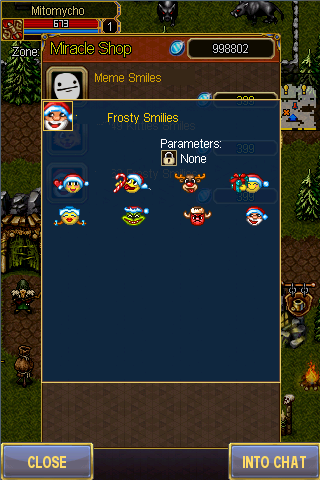 Right now we are unpacking boxes with fresh sets of smileys in the Miracle Shop! Now you can easily break the ice in a cold conversation, cool down your opponent, show your true sympathy or... post a cat at the suitable moment! Well, every moment is suitable for a cat. Right? “Winter”. Smiles inspired by winter which always leaves, but then always comes back. It’s the best way to remind everyone that Winter is coming. And works on every season, available only till the 1st of March! “Memes”. Well-well-well, what do we have here? Ahaha, memes, finally! 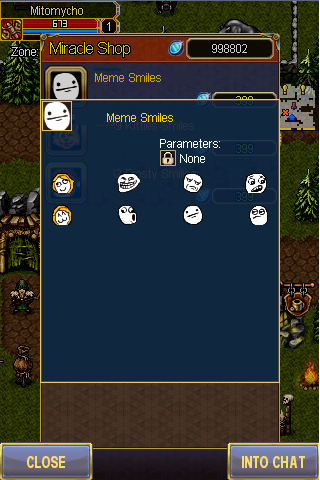 With a pack of memes emoticons you don't even have to be funny to give somebody a good laugh. Enjoy and be popular! “Cats”. Cats don't need to be promoted. Our game is online and the internet without cats is like Bonnie without Clyde, Crime without Punishment or bees without honey. Luckily, their pesky absence is now over! 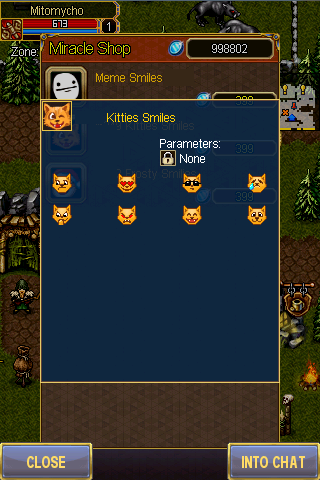 To use newly bought packs – just tap the emoticon button in chat menu and pick the one you want! Rogue remains invisible after using the Extermination skill. 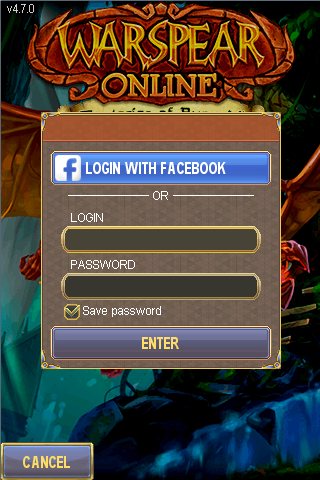 Good news for those who have Facebook account. Now you can connect your Warspear Online profile to your Facebook page and if you ever forget game login or password (or both), then you can enter the game using Facebook account. Option works for iOS, Android, Windows Phone 8, Windows, Linux, Mac OS. Feel free to use elixirs, scrolls or food before entering Arena. Bonuses they provide don’t dissapear in case of defeat any more. Game chat now has a profanity filter, which will replace all the bad words with ?%;№ symbols. But if you want to know what people really think about you, you can disable this option in the game settings. Each game character, starting from level five, will get five Teleportation Scrolls and five Life Scrolls! That’s all for now! Follow our news on the forum and social networks! P.S. Due to numerous requests, the period of absence for the head of the Guild until leadership is transferred to the next-ranking player, was extended to 14 days. Looks nice! But u really need to buy smiles? How much the reset takes? And another question, will ppl be able to see our FB account? And the award for most money hungry game goes to..
why we need to buy new emotions ? and about the pass leadership. even im not a leader. i disagree with that i dont need to explain.. no ofensment . last thing i wanted to say . 'u really love rouges' ima ranger i really hates rouges. Nice new changes, but looks like if we ask for new emoticons, we should pay. Auto transferring guild leadership is not really a good idea. You guys should think about it again. lets say we were sick or had some problem and couldnot play for a month. When we come back, what we find is our guild that we build up using our labour and money is in another persion hand. The game is full of scam and fraud. We cannot really hope that we will get our leadership back. Maybe this is not the always case. But losing guild because of auto transfer has maximum risk. 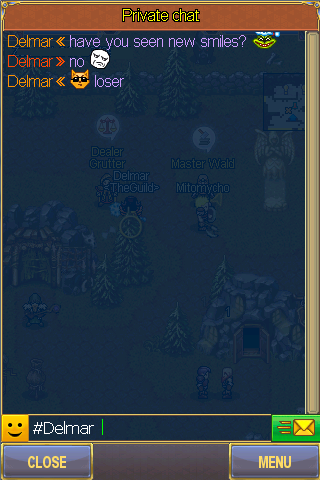 The only way remain for a guild leadr is to kick or keep all the member ranks stuck to newbie. Just imagine hassn losing his leadership of AOA. So guys, better give it a second thought. But why we have to but smiles!!! What ill do if i have 0mcoin??? XD just watch people sending smiles??:! Bad idea. To give leadership to other player. 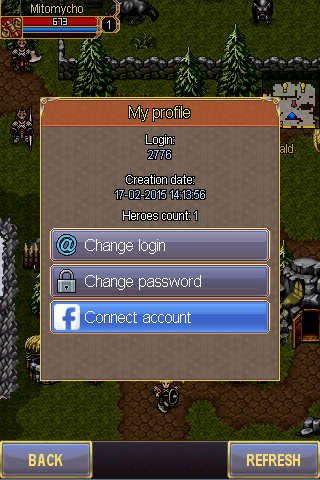 Hassn made him guild pro he lv up him guild to 6lv and he offline very long time. So he lose him guild and bye bye to aoa??? this transfer leadership thing is just a problem rather than a useful feature. Leader made the guild and lvled it up, he can be off for a year if he want to. Members can quit if got problem. yes thank you for allowing extermination in stealth, but theres a bigger issue with this skill though. it does not make good sense for the skills effect duration to decrease while increasing its level .. at 1/4 it lasts about 20 seconds so im thinking cool 10% cd and 5% spd increase for 20 seconds not bad ..thinking ok upping it now wud be perfect. so i make it 4/4 and im like 40% cd and good speed BUT EEERRM.... it lasts only half the time it did at 1/4 .. what a waste of 2 books just to take it down again. THATS CHEATING GUYS Comeon!!.. my suggestion is to leave the duration set at 20seconds for 1/4 up til 4/4 cos otherwise it another useless skill kinda like flurry which wud be great if it didnt take so long to release. that time pressing the button, watching effect and actually throwing a knife is another ripoff..